A three-year starting pitcher for the Vikings, Waro has struck out more than 300 batters and has helped Eastern to three consecutive winning seasons. 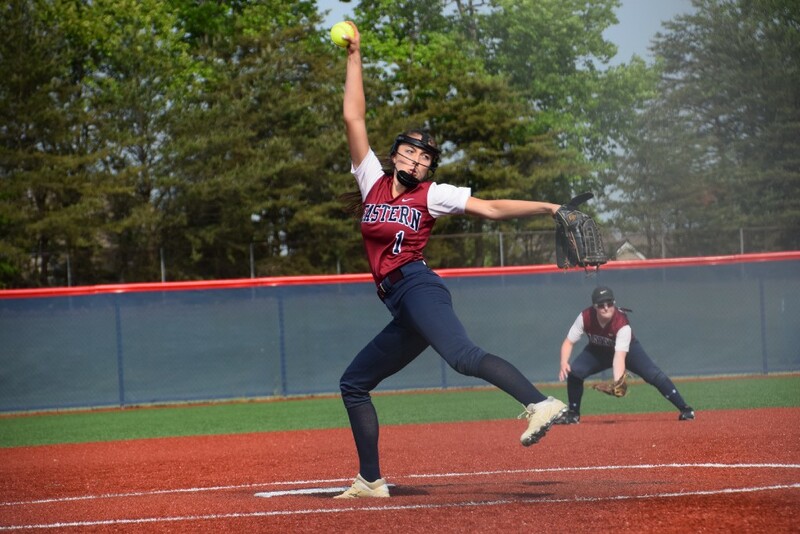 When Eastern Regional High School senior Rachel Waro looks back on her three-year varsity softball career, she doesn’t remember how many games she’s won as the team’s starting pitcher. She doesn’t keep track of her stats and was surprised when she was told she had recently topped 300 career strikeouts. Waro has plenty of good memories from the past three years. She emerged as a sophomore when she helped Eastern to a 25-win season and a spot in the South Jersey Group IV finals. She has been name all-Olympic Conference twice and has also played for the Olympic/Colonial Conference team in the Carpenter Cup softball tournament. Despite all of these accolades, Waro’s softball career is coming to a close. Even though different schools tried to recruit her, Waro has chosen not to play softball in college. She will instead attend St. Joseph’s University, where she plans to pursue a degree in accounting and will try to complete a five-year program in four years. The decision to not play in college was tough for Waro, as she exhibits an incredible amount of passion and love for the game. Waro has played softball for most her life and has pitched since the age of 8. Waro showed plenty of talent from an early age, playing for multiple club teams against older competition. Though Waro has a ton of great memories from her softball career, most of her favorites have taken place over the past three years. Waro made her varsity debut as a sophomore in 2016 after spending most of 2015 on the freshman team. Waro’s first career pitching appearance against Gloucester Catholic High School in the 2016 Camden County Tournament still sticks out to her. “It was a night game, it was our first night game of the season,” Waro recalls. “I started that game so I came out on the mound. Waro helped Eastern defeated Gloucester Catholic, 3–1. Her strong performance earned her more opportunities as the season continued. Once May rolled around, Waro was not only Eastern’s top pitcher, but also one of the best in South Jersey. In 2016, the Vikings won 25 games and advanced all the way to the South Jersey Group IV tournament. That year’s team was extra special for Waro, as she got to play with her sister, Sarah, who was a senior. “My sister was here and the crew that we tried to develop here had such great chemistry,” Waro said. That season was also catcher Raelyn D’Onofrio’s first year on the team as a freshman. Waro and D’Onofrio immediately developed a bond and became close friends. The 2016 season’s final game ended on a low note for the Vikings, as they lost a thrilling sectional final to Egg Harbor Township High School, 7–6, in 13 innings. Waro pitched the entire game, allowing just nine hits in 12 and two-thirds innings. Despite the outcome, Waro says the game remains the greatest she’s ever played in. “It just showed how we were willing to battle, not only to win and for our passion for the game, but for each other,” Waro said. While Waro has had plenty of success as a pitcher, she’s also been a strong leader in the community. In January, Waro received the Voorhees Selfless Student of the Year Award from the Voorhees Breakfast Rotary Club for serving as a student leader and volunteering for numerous organizations and programs. Waro has received multiple academic awards on top of her softball honors and is a member of the National Honor Society. “School comes first,” Waro said. “It’s something we also stress here at Eastern, which I’m very happy and proud of at our school. Though Waro plans to put her entire focus on academics beginning in the fall, she doesn’t plan to leave softball entirely. She promised to return to Eastern to attend games after graduation and hasn’t ruled out possibly coaching some day.